I’ve been experimenting with using amakoji in baked goods. 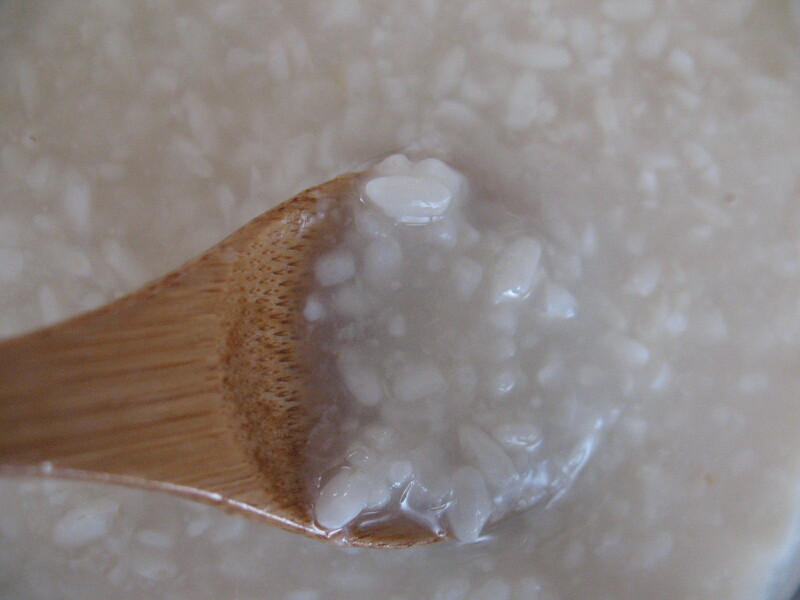 It’s made from cooked rice and koji and is sweet- it can be used in place of or in addition to other sweeteners. I also used shio-koji instead of salt. 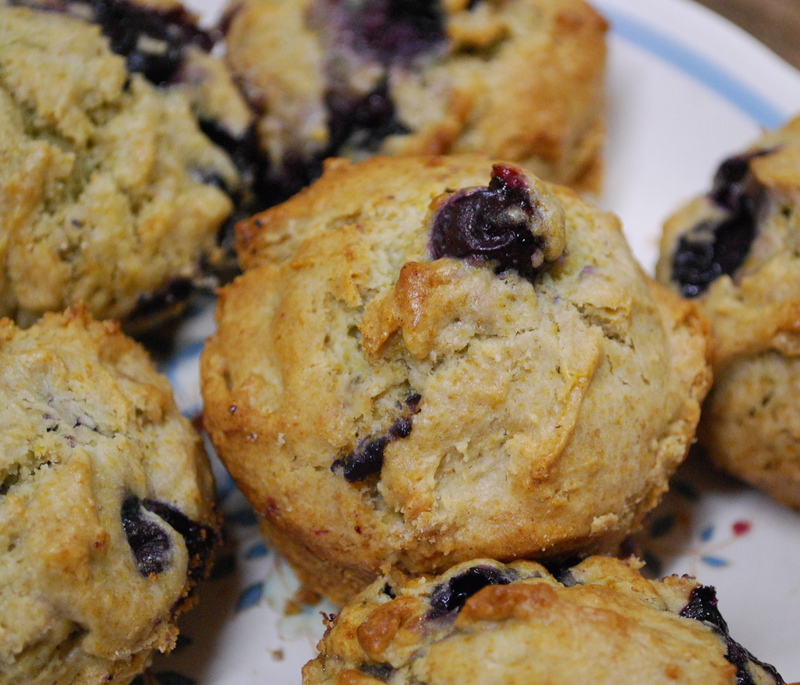 These simple sweet muffins are perfect for breakfast or an afternoon snack. Lightly oil the muffin tins. 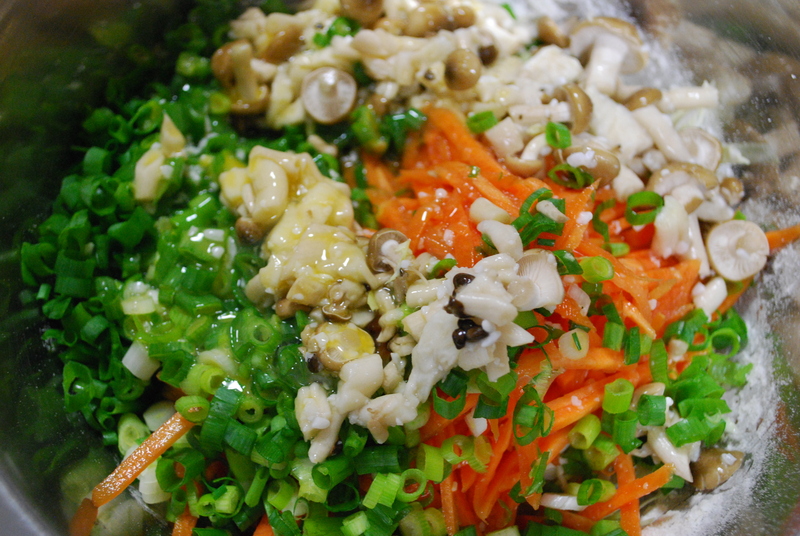 In a large bowl, mix together the eggs, oil, vegetable oil, brown sugar, vanilla, amakoji, shiokoji,and lemon juice. In a separate bowl, sift the flours and baking powder. Stir the dry ingredients into the wet ingredients and combine until wet. Do not overmix. Fold in the blueberries. Fold in the additional ingredients. Spoon into the muffin tins and bake for 20-25 min until the a toothpick comes out clean. I continue to use shio-koji in my daily cooking, but have been busier than usual and haven’t had time to write. I’ll post a few recipes this weekend. 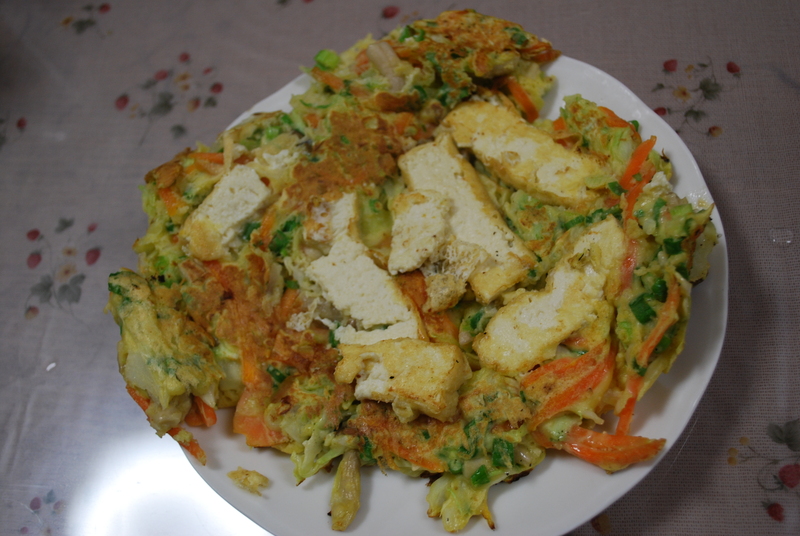 Tonight I made Vegetable Pancakes– similar to Okonomiyaki– but with more vegetables and no meat. The recipe is adapted from Sundays at Moosewood Restaurant. It’s a quick, easy dinner or lunch- you can use any sliced or chopped vegetables. 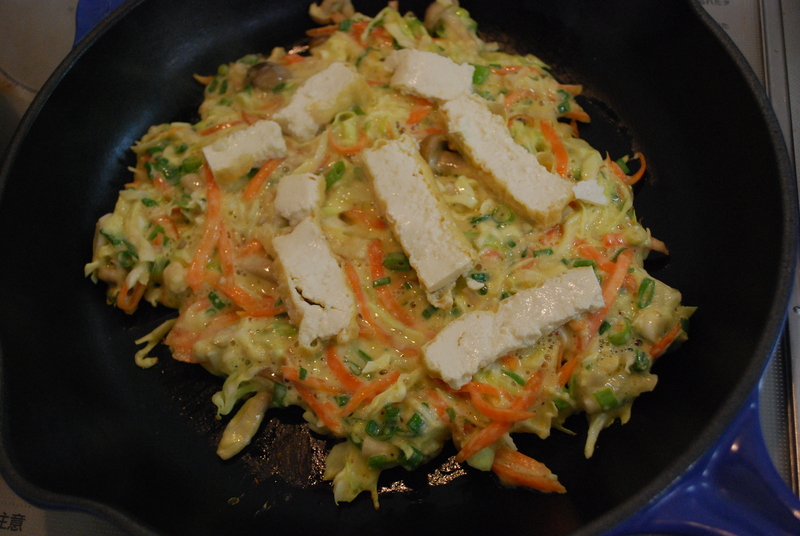 I used shiokoji to bring out the moisture in the shimeji mushrooms and sliced carrots and also in the batter. 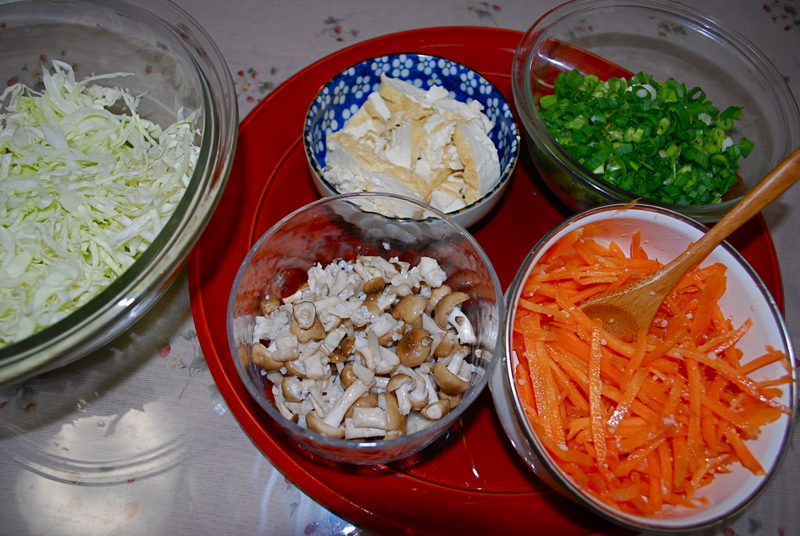 After chopping the carrots and cabbage, add shio-koji and mix to coat well. Let sit for a few minutes. Slice the abura age into thin slices. 4. Combine all the ingredients except the abura age together. Divide batter in half to make two pancakes. 5. Heat a small amount of oil in a frying pan and cook on medium heat until browned. 7. Serve while hot. Top with sauce- I like tonkatsu sauce- You can also use traditional okonomiyaki toppings. 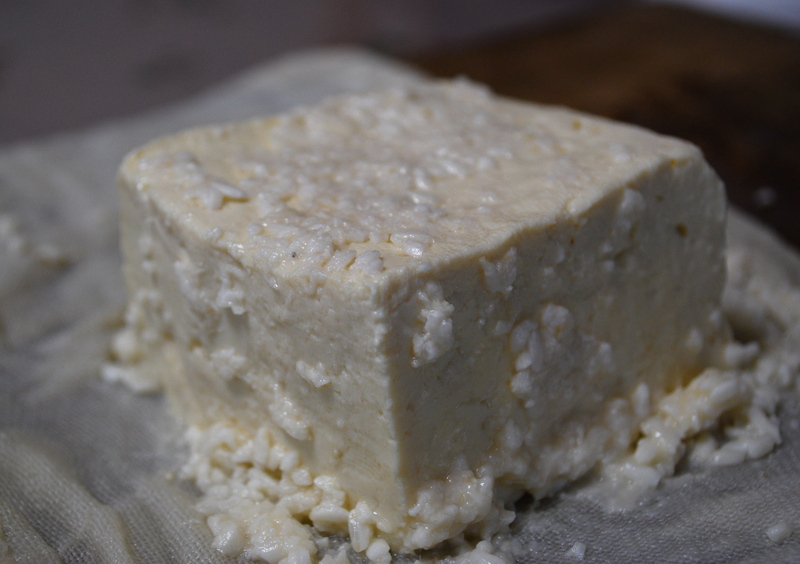 A friend mentioned that she made shio-koji tofu–a cheese-like tofu that has been marinated in shio-koji– and I decided to try and make my own. What a treat! I made some up late last week and let it marinate for 5 days in the refrigerator. It was so delicious, I am sure I’ll be making it regularly to use as is (sashimi style), as a creamy spread for sandwiches, and as a base for dips. 1. Cut the tofu in half and press it for a couple hours to get rid of excess water (Wrap it in a dishtowel, place it between two cutting boards with a weight on top) . 2. 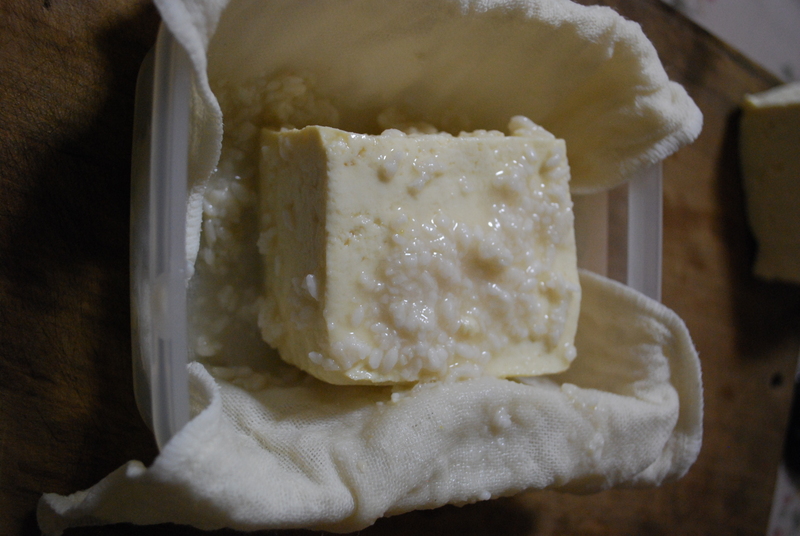 Spread shio-koji on all six sides of the tofu and wrap in cheesecloth. Place in a covered container and refrigerate for 3-7 days. 3. Remove from the refrigerator. Slice and serve sashimi style or as “cheese” for crackers. I’ll be trying to make some spreads with this. I can see it being a permanent item in my frig. What is it? 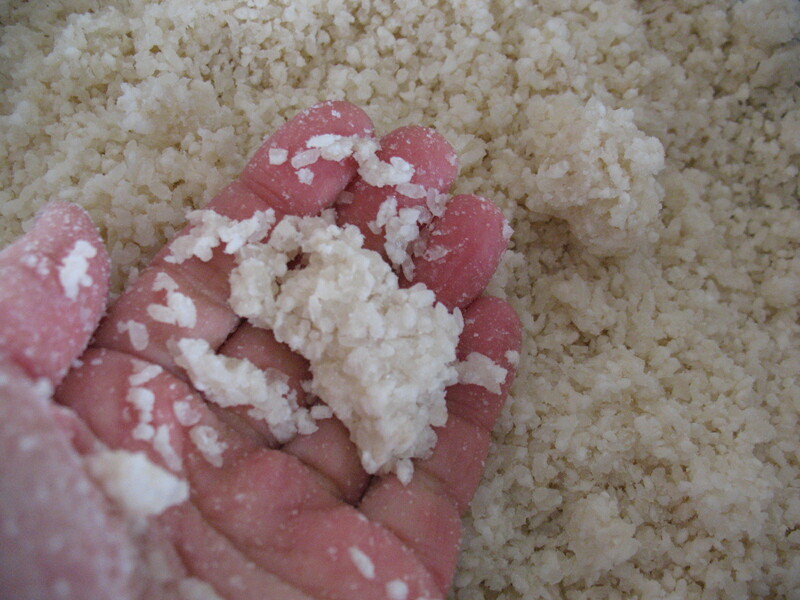 It’s koji that has been fermented in salt and can be used instead salt to bring out the umami in foods. I’ve got about 500 cc left of the shio-koji I made last month, so I need to start a new batch that will be ready when I run out. I use shio-koji instead of salt in almost all of my cooking now, so it goes pretty quickly. 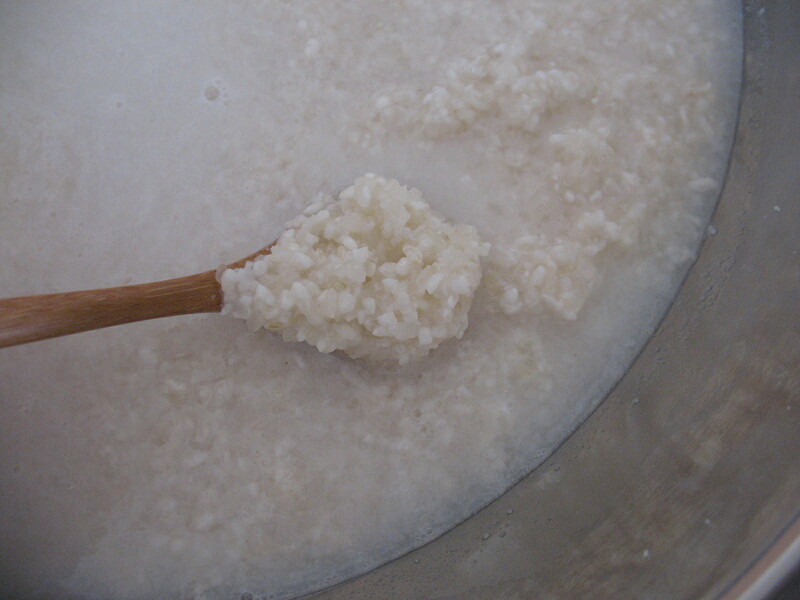 Last month I made two kinds of shio-koji using different kinds of koji. I used fresh rice koji from Kojiya Honten and made another with organic dried brown rice koji that I bought online. 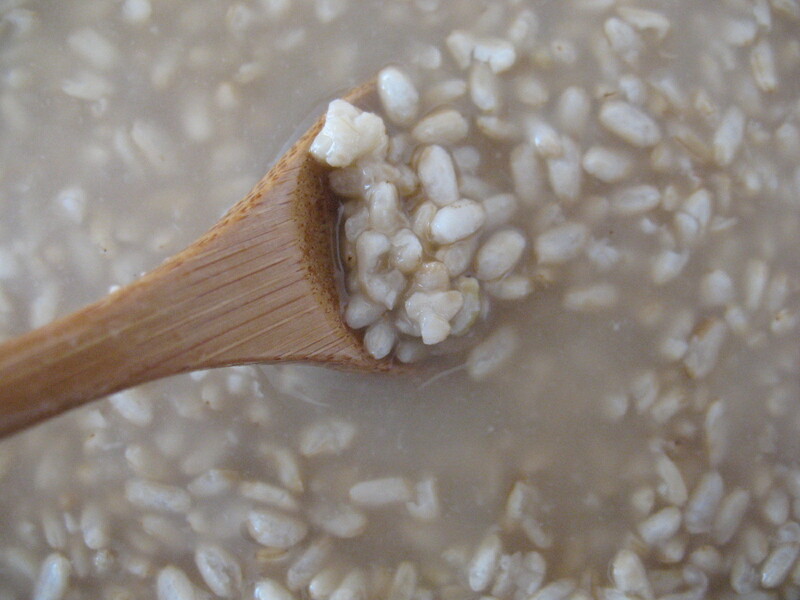 The brown rice shio-koji is a bit sweeter, but also a little grainier. I mixed it with a hand blender for a creamier consistency. The brown rice koji is a little expensive, especially with shipping, so I will probably only make it a few times a year. So today I will make regular shio-koji and get the fermentation started. 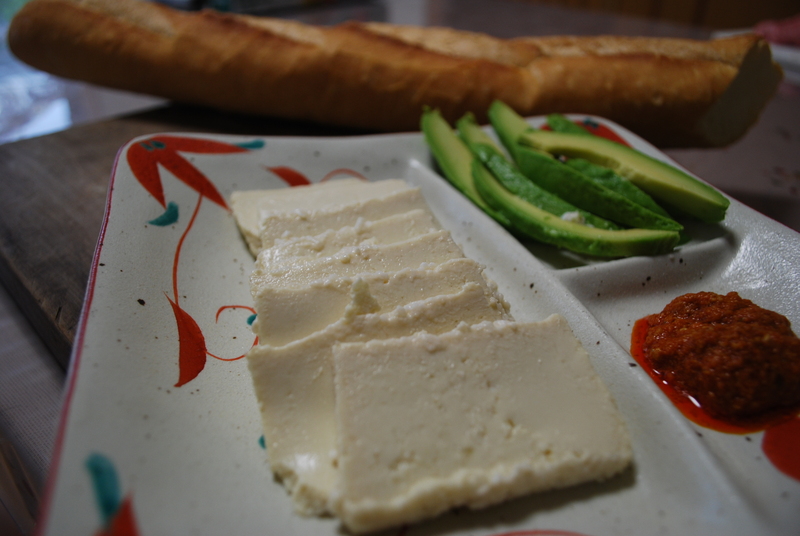 I want to try to make shio-koji tofu next week, too. Here is the recipe for shio-koji. It only takes about 15 minutes to prepare and then a little more than a week to ferment. Put the koji in a bowl and rub with your hands to break apart any clumps. Add the salt and mix with your hands, kneading the salt and koji together. Myoho always emphasizes that it’s important to put your heart into mixing the shio-koji- think positive thoughts and give appreciation for the koji- the finished product will be more delicious and satisfying. Mix until the mixture becomes slightly sticky and it clumps when squeezed. Put in a loosely lidded container and let it sit at room temperature for 10-14 days until the rice grains become smaller and the mixture has a slightly salty sweet aroma. Stir the mixture well once a day. When it is done, refrigerate. It will keep for about six months. So this batch will be ready next week. Gooey and sticky with a distinct aroma, natto is often served as a side dish of a traditional Japanese breakfast. It is usually seasoned with soy sauce and mustard, and sometimes mixed with a raw egg. 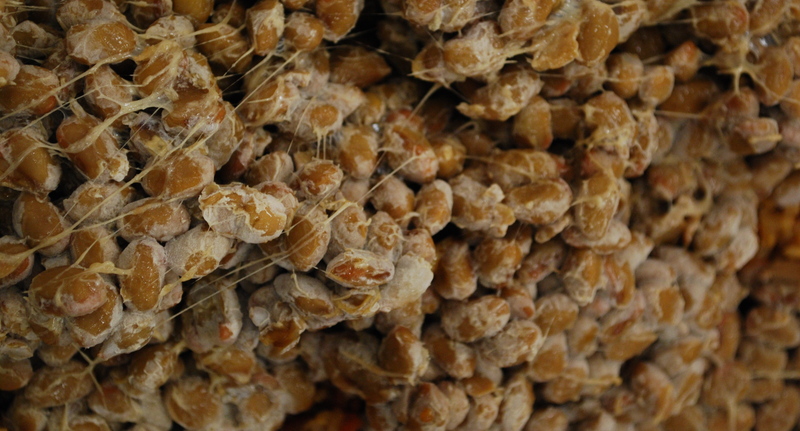 Natto is made from soybeans that have been fermented with the microorganism Bacillus natto. For most westerners, the texture is too slimy and the smell is too pungent, particularly so in the morning. Similar to other strong-tasting fermented foods such as blue cheese, it is definitely an acquired taste and people either love it or hate it. In Japan, natto is originally part of the food culture in colder climates, so many older people in Kyushu didn’t grow up eating it. Nowadays, natto is eaten all over Japan, but it is less popular in Western Japan. At Koijya Honten, they make koji natto, an enzyme-rich condiment that can be used as a side dish to accompany rice or as a topping on crackers. Even people who don’t like natto find it delicious. Easily made at home, it keeps about one month in the refrigerator. Thanks to koji-natto I am now among the ranks of those who like natto. Try it yourself. Koji shops are concerned with contamination of the environment by rogue bacteria and koji manufacturers are extremely careful to keep other microorganisms such as Bacillus natto out of their production area. Kojiya has successfully created a delicious, healthy product that uses both koji and natto. Put the koji into a bowl and rub together to break up any clumps. Peel the carrot and grate it into 5 cm lengths. Pour the soy sauce and saké into a large saucepan and heat. When it reaches a boil, stir in the carrots and turn off the heat. Transfer the carrot mixture from #3 to a large bowl, add the koji and stir. When it cools down add the natto, konbu and sesame seeds and mix well. Cool it to room temperature, place in a covered container and refrigerate. This is excellent as a rice topping. Mix with cucumber chunks for a simple, refreshing summer salad. Our local koji shop- Saiki Koujiya Honten- is a family-run business that has been producing koji for over 300 years. Myoho Asari, also known as the Kojiya Woman, has become well-known all over Japan for her work promoting the use of koji and shio-koji. Five years ago if had you asked anyone about shio-koji, noone would have know what you were talking about. But now it is one of the most popular cooking condiments in Japan. In fact, on the Japanese cooking website Cookpad.com it is the number one search term. Koji shops all over Japan are now experiencing an increase in sales because of this renewed interest. At Koujiya Honten, they have been so busy that they often sell out of koji by 10:30 in the morning. 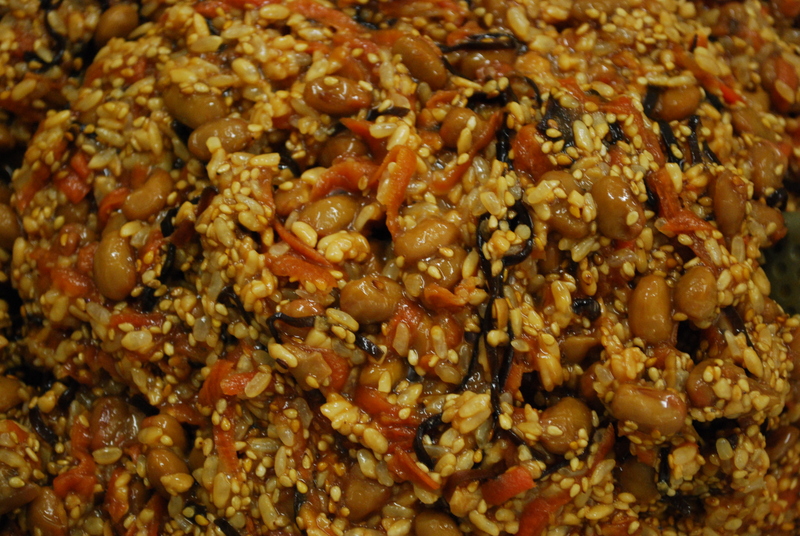 They sell fresh koji and several koji products such as shiokoji, koji natto, and miso. They only sell at their shop and online and the staff at the shop works non-stop 6 days a week producing koji and prepapring and packaging the other products.